αII Spectrin expression in vitro and in vivo. 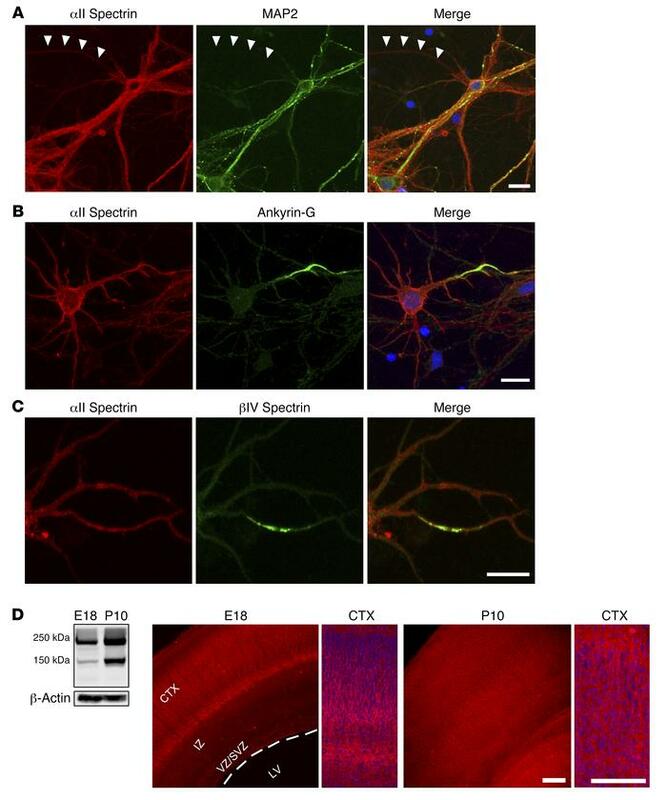 (A) αII Spectrin (red) is ubiquitously expressed in all neuronal domains of cultured rat cortical neurons, including the axon, dendrite, and soma. Immunoreactivity is intense in dendrites marked by MAP2 (green), as well as in the axon that is negative for MAP2 staining (arrowheads). (B and C) Ankyrin-G (B) and βIV spectrin (C) (green) specifically localize to the AIS and overlap with αII spectrin. Lower-magnification images are shown in Supplemental Figure 1. (D) Western blot shows that 240-kDa αII spectrin and its 150-kDa cleavage form are expressed in both the embryonic and the postnatal rat brain, with higher expression of both forms at P10 than at E18. See complete unedited blots in the supplemental material. In the embryonic brain, αII spectrin is highly expressed in the cortical plate (CTX), with low expression in the intermediate zone (IZ) and ventricular zone (VZ). LV, lateral ventricle. At P10, αII spectrin expression is more ubiquitous. Cortex is also shown with higher magnification. Scale bars: 10 μm in A–C, 100 μm in D.